In the 70’s we wanted reliable water temperature so we invented the Bi-Metallic coil, never to suffer a cold shower again. In 2001 you told us that having to stand under the shower before turning it on didn’t feel right, so we made you a remote control. No more wet arm! Now we’re doing it again. Our showers are evolving every year and the best is yet to come. We mean it when we say that we’re obsessed with showers so next time you are looking to buy a shower, remember Aqualisa and we’ll make sure yours is great too. Every single time. 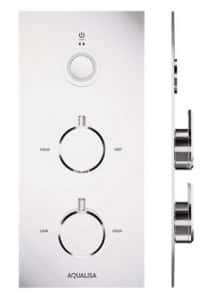 Aqualisa Infinia is the new, spa-style shower with an ultra-low profile control plate and unique customisable control dials. A strong design aesthetic combines with advanced precision performance based on Aqualisa’s award-winning technology. The low profile control plate of just 2.5mm sits flush to the wall. 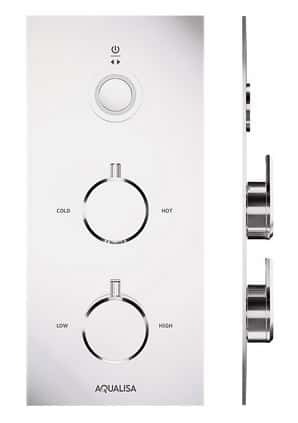 This houses the controls – temperature, and water flow which can be pre-set. Intuitive LED lighting indicates when the shower is ready. When the lights are red the water is heating up, blue it’s cooling down and when they’re solid white, the shower is at your chosen temperature. The shower can also be operated by a remote control sited up to 10m away. Infinia can be configured as a single or twin outlet shower, so you can switch between two shower heads at the touch of a button. Typically this would include a fixed drencher head for a full-on home spa experience and a height adjustable shower head for a quick splash before work and no wet hair. 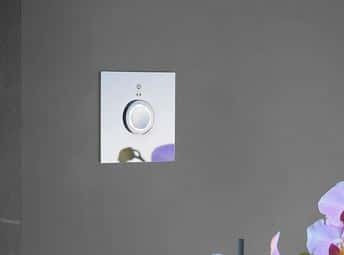 Three different shapes of control dial are available in two finishes, chrome or white, so you can customise your shower to contrast or co-ordinate with bathroom fittings.